SEOUL, Nov. 2 (Yonhap) — Growth of South Korea’s credit card spending slowed in the third quarter of the year due to the country’s fall harvest holiday, data showed Friday. Credit card purchases totaled 205.4 trillion won (US$181 billion) in the July-September period, up 6.7 percent from the same period a year earlier, according to the data from the Credit Finance Association. The growth figure was lower than a 9 percent on-year increase registered during the previous quarter. The data includes transactions made with credit, debit and prepaid cards. Cash advances, overseas spending and card loans were excluded. The slowdown was attributed to the Chuseok holiday that slowed card spending by both individuals and companies. The holiday fell from Sept. 24-26 this year. Spending by corporate credit cards came to 37.3 trillion won in the third quarter, up 2.4 percent from a year earlier. The growth rate was far lower than the previous quarter’s gain of 10.5 percent. 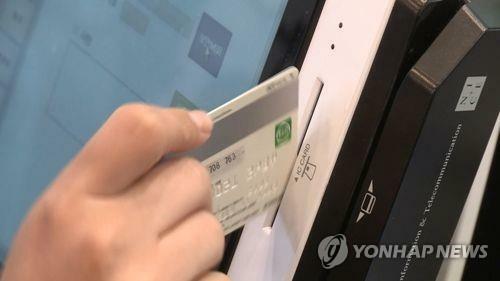 Personal credit card spending rose 7.7 percent on-year to 168.2 trillion won. The figure was also lower than the 8.6 percent increase three months earlier. The association said more South Koreans traveled abroad during the Chuseok holiday, which was partly responsible for the third-quarter slowdown.